Mirror’s Edge was a daring peak among the ups and downs of the last generation’s release roller-coaster, with a briefly emboldened EA taking a chance with a new IP and giving us a bold, visually stunning game that divided opinion. Its striking looks and breakneck, free-running action drew in as many people as it repelled, with the sharp learning curve and lack of hand-holding in order to master it putting many off. But it earned itself a passionate following, with dedicated runners still shaving milliseconds off Speedrun world records, years later, and its fans desperately hoping for a follow up game. 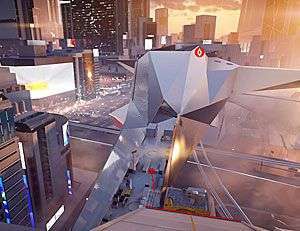 Now, we’re finally on the brink of the release of Mirror’s Edge Catalyst and EA threw open the doors for a beta weekend to give us our first taste of their reimagined (now open) world. As a dedicated player of the original, I could barely wait. Having played the recent beta, however, I came away feeling unconvinced that it’s the game we’ve been waiting for. 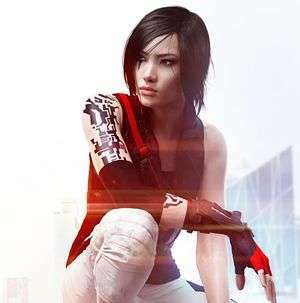 Rather than giving us a sequel or even a prequel (which would have built up Faith’s relationship with Mercury, Jacknife, and Celeste and given their place in Mirror’s Edge more impact and meaning) EA caught reboot-itis and bailed. Stepping away from what they had originally created, they reimagined the city and story, and took Faith back in time to her earlier days as a runner. Bar Faith, the original game’s characters have vanished and new ones slotted into place, but the concept is still the same. In a world where information and people are controlled and monitored, and citizens imprisoned for the slightest offences, those wishing to avoid prying eyes use Runners to courier sensitive information and packages across the city’s sprawling rooftops. It’s a sort-of-prequel, but… not to the original game. It’s tough to explain. A ‘soft-reboot’ is perhaps as close as I can get. Anyway, we drop into Faith’s shoes as she reaches the end of a jail term and is reunited with her Runner companions on the rooftops of the City of Glass, ready to prove herself to the people she let down. It isn’t just the story and world that have changed, however. Faith isn’t the young woman we came to know all those years ago. From the outset, her move set is stripped back, and even basic moves, such as the leg tuck and the roll are locked away behind segments of the new skill trees. Yes, it rather baffled me too. Catalyst boasts a simple trio: movement, combat, and gear, all fed by XP. One could argue that the latter two trees are largely pointless in a game like this, where movement and flow are King (or Queen). 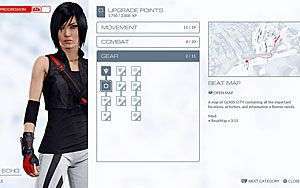 But, even if you were to focus on just movement, it would take quite a while to bring Faith up to the level she was at the start of the original game, especially as certain missions need to be completed in order to unlock access to parts of the skill trees. It could be argued that the gradual drip feed of skills – utterly common in games to prevent overwhelm, among other things – helps make an otherwise potentially complicated game more accessible to newcomers. However, in doing so, it risks frustrating and alienating the familiar, or veteran, players who want to be able to at least roll on a hard landing – the simplest of skills – let alone execute a multiple wall jump. It felt like a bolted-on, alien system that seemed designed to try and force longevity from the game, rather than provide anything genuinely engaging or meaningful, which was a shame. The movement system – such a defining part of the original game – feels easier here, somehow, but also smoother than the original (some have argued that it is more forgiving, or on rails), with the ability to use pipes to peel effortlessly around corners being a lovely inclusion. The usual moves are all present, and skill will still be required to pull them off, especially for hard-to-reach collectibles and alternate routes. To add a new flavour, some moves can be coupled with the game’s new combat system to deliver powerful attacks. With the original game’s much-derided gunplay having been tossed out of the window, EA have instead focussed their efforts on melee combat, with mixed results. Early on in the beta there were several forced combat sections, in which running away was not an option (and even led to mission failure in one case). Just as the gunplay in Mirror’s Edge could feel forced at times, so does the combat in Catalyst, so it’s a questionable replacement. The inclusion of enemy health bars does little to help matters, meaning that the flow of movement can screech to a halt as you kick and knock enemies about. This is largely because the game wants you to pull off its new traversal moves, which you’re shown and tested on early on. Kicking an enemy off the back of a springboard or wall run will see you deal far greater damage than running up to them and sticking the boot in, meaning that, in theory, your flow should never be interrupted for long, as the combat should be a natural extension and, indeed, part of, the running. Aesthetically Catalyst veers away slightly from its predecessor. Objects such as pipes and boards are still marked in the trademark red, but the world itself has traded the crisp, eye-catching look of the first game for an overall softer tone – at least in the open world. It is glossy, glassy, and a realistic world of the future, with drones zipping between buildings and people going about their business in high rises and office buildings while you and your kind populate the rooftops, which are filled with familiar vents, zip lines and architectural clutter. Strangely enough, though, it is inside that the game most feels like the original, especially in terms of looks, with the bold colour palette and feel of the labs and offices making Catalyst pleasingly familiar. In the missions available in the beta there has been little diversity as far as locations go. Rooftops, zip lines, slick high-rises and cavernous office buildings abound but, in what was made available, the game didn’t really veer from those same areas. 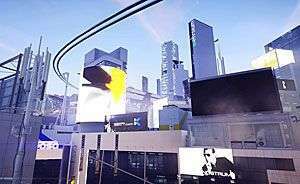 So far, we’ve seen nothing to suggest that we’ll be anywhere but the rooftops of Catalyst’s open world, with occasional forays into the interior, meaning that repetitiveness is a real concern. While the storm drains, warehouses, ship, mall, and offices of Mirror’s Edge may have drawn some flak at the time for veering from the concept of pure, rooftop free running, they often provided some of the game’s biggest challenges and greatest moments, and helped to break up any monotony. Whether or not the same diversity will be revealed in Catalyst is currently unknown, but it would prevent the game from feeling too one-note, which feels, at the moment, like it could be a risk. One of the dangers of an open world is emptiness. What do you do with all that space now that you have opened it up? Filling it with more than a few yellow bags is a good start and the game boasts a raft of collectibles, from the traditional bags, to the now-obligatory audio recordings, to computer chips, electrical parts and more. It adds a level of interest in exploring the city and will no doubt encourage daring climbs and mastery of many of the more complex moves in order to get them all, which is a good thing, especially if longevity is on the game’s checklist. Much of the appeal of Mirror’s Edge were the Speedruns and Time Trials and the hours, days, and weeks that could be lost in the pursuit of perfection. Sadly, Speedruns appear to have vanished – a victim of the new mission structure, perhaps. Time Trials are back, however, along with smaller races called Dashes, which are dotted about the city and also have a goal of three elusive stars for each one. Dashes differ from Time Trials in that they are shorter and there are no checkpoints, leaving the player to simply get from start to finish as swiftly as possible, by any route. On the surface they seem easier, and the game will guide you, but the best times can be forged by going off the prescribed route and studying the lay of the land to come up with a quicker alternative. That said, some of the better options aren’t available until you have unlocked specific moves from the skill tree, meaning that the high scores on the Dashes aren’t attainable until you’ve worked your way into the game. Time Trials now appear as part of the game’s Social Play features. Players can now create and upload their own Time Trials, with the ability to set a route and drop checkpoints, making things as easy or fiendish as they like for other players. While it’s not the level-builder playground that many wanted, it may well satisfy competitive gamers who have a lot of friends also playing the game. Aside from the create-your-own, the Time Trials (as far as I could see) were locked off in the beta, so it isn’t yet clear whether or not there are dev-created ‘official trials’, but it’s hopeful. With a host of other little changes and additions, the Mirror’s Edge Catalyst beta was a mixed bag, overall. Fans of the original may struggle to fall in love all over again, especially with the skill tree/XP system and open world, but persistence and the game’s release could well see those barriers overcome. Should the forced combat be kept to a minimum and more diverse locations and missions made available, it could be the game that fans hoped for. Leaderboard jockeying will likely be as fierce as ever, and online Time Trial and Dash runs a thing of beauty to watch, but with the game’s release slipping again, due to user feedback from the beta, it remains to be seen whether or not Mirror’s Edge Catalyst can live up to the dream its fans have built.